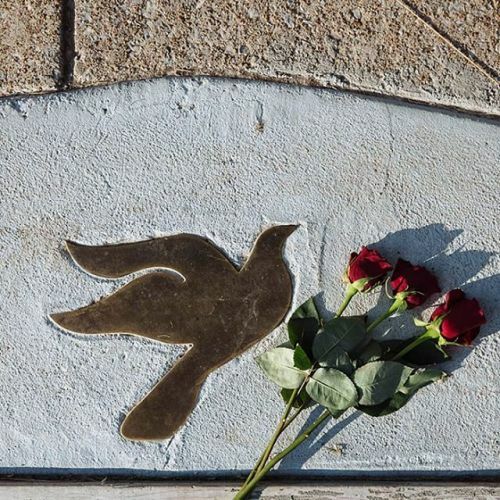 “A plaque of a dove laid in concrete on the sidewalk to replace the impromptu memorial to Michael Brown in Ferguson, Missouri, where he died. Sunday will mark one year since #Ferguson was torn by unrest after a white police officer fatally shot #MichaelBrown. In recent months, the city has taken steps toward repairing racial scars, rebuilding its battered commercial areas and diversifying its once white-dominated government. Yet Ferguson remains divided — this time between those who think its progress is real, and those who believe that little beyond the superficial has changed. Photo by @whitcphoto” By nytimes on Instagram.